The 2016 melt season on the Greenland ice sheet continued the overall increasing melting trend, with enhanced melt occurring in the southwest and northeast regions. The onset of surface melt ranked 2nd (after 2012) over the 37-year period of record (1979-2016), with the duration of the melt season longer than usual in the northeast (~30-40 days) and along the west coast (~15-20 days). Ice loss measured in-situ at high elevation in the southwest was the 2nd highest in the 27-year measurement period, beginning in 1990. Albedo was the 5th lowest in the 17-year period of record (beginning in 2000) for both July and summer averages, with particularly low values along the southwest coast. Widespread above average surface air temperatures were observed in the west and the south, with many observational sites setting new records for the spring (MAM) and summer (JJA) seasons and in individual months. The Greenland ice sheet plays a crucial role globally and locally, impacting the surface energy budget and climate and weather and contributing to current and future sea level rise. Estimates of the spatial extent of surface melt across the Greenland ice sheet (GrIS), over the period 1979 to 2016, are derived from brightness temperatures measured by the Special Sensor Microwave Imager/Sounder passive microwave radiometer (e.g., Mote 2007, Tedesco et al. 2013). Though 2016 was not a record-breaking year in terms of melt extent and duration, it extends the overall increasing melting trend. The updated trend for melt extent over the period 1979-2016 over the whole Greenland ice sheet is +15,824 km2/yr. In 2016, there was an early start to the melt season on April 10th, with melt extent in April reaching values typical of early June. The melt onset date in 2016 is ranked second, by only a few days, to the melt onset day in 2012 on April 4th. Periods of extensive melt (exceeding two standard deviations above the mean) were also recorded in mid-May and in June (Fig. 3.1a). The melt extent for the period June through August (JJA) 2016 was above the 1981-2010 average on 66% of days, compared to 54% of the days during the same period in 2015. The anomaly of the number of days when surface melt occurred with respect to the 1981-2010 period reached its peak in the northeast region (Fig. 3.1b). The number of melt days was also anomalously high along the west and southwest regions, though not as pronounced as in previous years. Fig. 3.1. (a) Spatial extent of melt from SSMIS as a percent of the ice sheet area during 2016 (red line) and 2012 (grey line), the 1981-2010 mean spatial extent of melt (dashed blue line), and ± 2 standard deviations of the mean (shaded). (b) Map of the anomalies of the number of melting days obtained from passive microwave data for 2016 with respect to the 1981-2010 mean. Black dots represent the locations of selected PROMICE stations and yellow squares show the location of the K-transect stations. Both plots were produced in conjunction with the National Snow and Ice Data Center. The mass balance year 2015-2016 along the K-transect (van de Wal et al. 2005, 2012), located in the southwest part of the GrIS, was characterized by a very high ablation rate at high elevations (Fig. 3.2a). In general, there has been an upward migration of the equilibrium line altitude (e.g., the altitude at which the surface mass balance is zero). In 2016, the surface at S9—originally located along the equilibrium line altitude of 1500 m. a.s.l. at the beginning of the time series—showed areas of exposed bare ice, consistent with anomalous melting conditions. 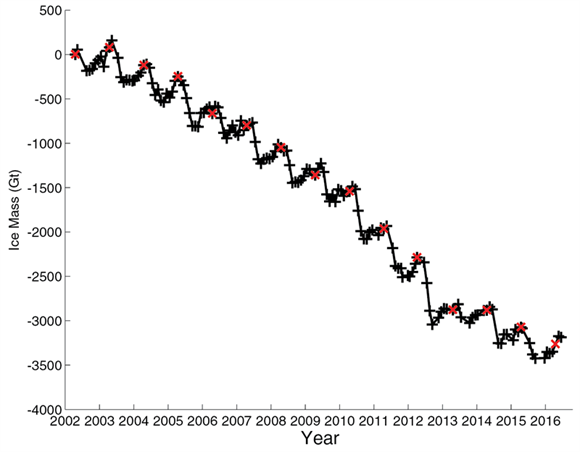 Since measurements started in 1991, the ablation rates averaged over the transect have only been higher than 2016 during the 2009-2010 mass balance year, when ablation rates at the edge of the ice sheet were also extraordinary high (Fig. 3.2b). The high rates in the upper ablation area can be explained by a combination of limited winter snow accumulation and early melt onset. The latter created a relatively low albedo and, hence, high melt rates. The mass balance gradient along the K-transect (e.g., slope of the SMB plot at different elevations in Fig. 3.2b, 3.1 mm water equivalent of ablation per m of height difference per year) in 2016 was comparable to 2015, with the major difference being that in 2016 the equilibrium line altitude was located at a higher elevation. Fig. 3.2. (a) Cumulative mass balance since the start of the measurements in 1991 at S9 (1500 m. a.s.l. and formerly the equilibrium line altitude) along the K-transect. (b) The surface mass balance as a function of elevation along the K-transect for the last seven years. The equilibrium line altitude is defined as the altitude at which SMB = 0 and can be identified as the elevation at which the surface mass balance crosses the zero value. Net ablation recorded by PROMICE automated stations (www.promice.dk; Van As et al. 2016) for 2016 were all within 1 standard deviation of the 2008-2016 average. Above average melting occurred along the entire ice sheet margin except in the Upernavik (UPE ) and Thule (THU) regions, which lie in the northwest (Fig. 3.3a). However, when put in a longer-term contest, the same stations show ablation anomalies up to 124% larger than the 1961-1990 average (Fig. 3.3b). The largest ablation during the summer of 2016 for the PROMICE stations was 6.3 m w. eq. at the ice sheet margin in the Qassimiut (QAS) region, which is located at the southern portion of the ice sheet, closely followed by the stations of Tasiilaq (TAS) in the southeast and by Kangerlussuaq (KAN) on the west coast. Fig. 3.3. 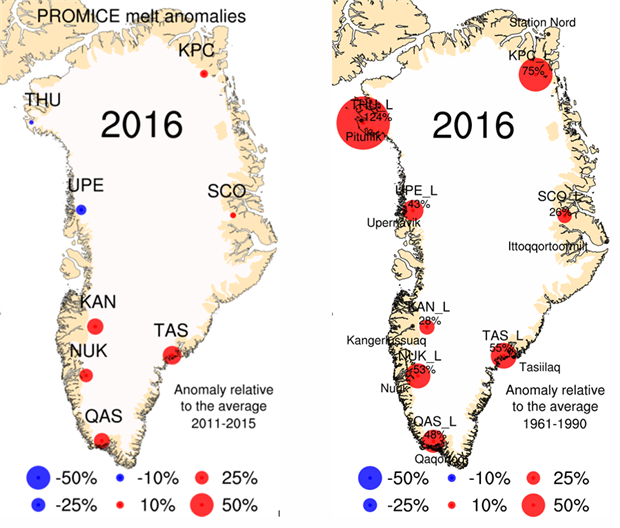 Net ablation anomalies for 2016 at the Programme for Monitoring of the Greenland Ice Sheet (PROMICE) weather station sites, relative to the average over the baseline period (left) 2011-2015 and (right) 1961-1990. GRACE satellite gravity estimates obtained following Velicogna and Wahr (2014) and available since 2002, indicate that between April 2015 and April 2016 (the most recent period of available data) there was a net ice mass loss of 191 Gt (Fig. 3.4). This is about the same as the April 2014-April 2015 mass loss (190 Gt) and smaller than the average April-to-April mass loss (232 Gt) over the period of record. The trend of total ice mass loss for the 14-year is 269 Gt/yr. Fig. 3.4. Monthly change in the total mass (in Gigatonnes) of the Greenland ice sheet between April 2002 and April 2016, estimated from GRACE measurements. The red crosses denote the values for the month of April of each year. The average summer albedo is derived from data collected by the Moderate-resolution Imaging Spectroradiometer (MODIS, after Box et al. 2012) and spatially averaged over the entire ice sheet. In 2016, the average summer albedo (June through August, JJA), was 71.1% (Fig. 3.5a). This is ~4% lower than in 2000-2001, when MODIS data were first available, and the 5th lowest albedo in the 17 summers of record. The minimum average summer albedo was recorded in 2012 (68.2%), the year of record maximum melt extent. The trends of summer (Fig. 3.5a) and July mean (Fig. 3.5b) albedo for the period 2000-2016 are, respectively, -5.3±1.0% and -6.2±1.2%. July is the month when the solar incident radiation is at the maximum and, therefore, the impact of albedo in the energy balance is crucial. Low summer albedo anomaly values were widespread (Fig. 3.5c). Consistent with the spatial distribution of melt anomalies (Fig. 3.1b), the largest area of low albedo anomalies (reaching down to ~ -20 %) was located along the southwestern ice sheet, as in previous recent years (e.g., Tedesco et al. 2016). Only the northwestern portion of the ice sheet was near normal albedo. Fig. 3.5. (a) Time series of summer (JJA) and (b) July MODIS albedo averaged over the entire ice sheet. The time series begins in 2000. (c) Map of MODIS albedo anomaly for summer, relative to the 2000-2009 reference period. Also consistent with the spatio-temporal variability of melt and albedo, measurements at fifteen weather stations of the Danish Meteorological Institute (DMI, Cappelen 2016) indicate widespread above average air temperatures in 2016 (relative to the mean for the period 1981-2010). Records were set in 2016 for summer and spring seasons as well as in individual months (Table 3.1). New surface temperature records were set during the spring season (March through May, MAM) at Kangerlussuaq, Aasiaat and Summit. April was particularly warm, with new records set at Summit and six other sites. Summer (JJA) temperature anomalies were positive at all stations around the Greenland coastline, with new records set at the southeast coastal site of Tasiilaq, at the northeast site of Danmarkshavn and at the southern site Narsarsuaq. July temperature at Tasiilaq in 2016 was +2.5 °C above normal, second only to 1929, and at Nuuk was second only to 2012. The month of August was record warm at Illoqqortoormiit. At the remaining DMI locations, summer temperatures below the average (e.g., cooler than average). Table 3.1. Surface temperature anomalies [°C] and z-scores at the different DMI stations for the periods of fall 2015 (SON), winter (DJF) 2015, spring (MAM) 2016 and summer (JJA) 2016. Station names, together with the year in which observations began and the corresponding coordinates are also reported, along with the years when maximum and minimum records were set. Highlighted text indicates the stations and periods when 2016 set a new record. Data recorded by the PROMICE network (sites shown in Fig. 3.3) are consistent, indicating above-average air temperatures for 88% of all January-August 2016 station-months. The average Greenland Blocking Index (GBI, here defined as the average 500h Pa geopotential height for the region 60°-80° N and 20-80° W, e.g., Hanna et al. 2013) calculated from the NCAR/NCEP Reanalysis was the second highest since 1948, following only the extensive melt year of 2012 (Nghiem et al. 2012). Persistent periods of high GBI values have been associated with extensive Greenland surface melt and negative surface mass balance (Hanna et al. 2013, McLeod and Mote 2015). Despite the near record GBI, the average daily melt during summer of 2016 was much less than the record breaking year of 2012. A major difference between the 2012 and 2016 atmospheric conditions was the lack of water vapor transport, and associated latent heat and downwelling longwave radiative fluxes in 2016, which have recently been shown to have a considerable effect on ice sheet melt (Mattingly et al. 2016). The average daily melt during summer of 2016 was comparable to 2015 and 2014, continuing the overall trend towards increasing melting. Marine-terminating glaciers are the outlets via which the Greenland ice sheet discharges ice mass to the ocean. When in balance, the rate of iceberg calving (by area) is equalized by the seaward flow of the ice (see the essay on Greenland Ice Sheet Surface Velocity: New Data Sets, 2015 Arctic Report Card for further information on the velocity of these glaciers). Glacier area measurements from optical satellite imagery (Landsat and ASTER) area available since 1999. These measurements evaluated at the end of the melt season to minimize the influence of observed winter advance (Jensen et al. 2016). In the most recent year, from 2015 to 2016, the area changes at 45 glaciers that are among the widest and fastest-flowing marine-terminating indicate a continued pattern of retreat. With a total net glacier front area change of -60.6 km2 (net area loss), 2016 was characterized by the largest area loss of marine terminating glaciers since 2012 (Fig. 3.6). A total of 22 glaciers retreated (100.8 km2 area loss), 11 glaciers advanced (40.9 km2 area gain), and 12 remained relatively stable, with a net area change smaller than 0.2 km2. The area changes do not count the -100 km2 area from Spalte glacier that detached after years of rift propagation. The largest area losses occurred at northern Greenland glaciers, led by Ryder (-23.5 km2), Zachariae (-15.5 km2) and Storstrommen (-11.0 km2) glaciers. The largest advances were observed at Jakobshavn (+4.5 km2), Helheim (+2.1 km2), and Upernavik A (+1.6 km2). See http://gac.geus.dk/ for glacier locations. Fig. 3.6. Cumulative net area change (km2 and miles2, left and right axes, respectively) at the 45 of the widest and fastest-flowing marine-terminating glaciers of the Greenland Ice Sheet (after Jensen et al. 2015 and Box and Hansen 2016). MT would like to acknowledge the NASA Cryosphere Program, the NASA IDS program (NNX14AD98G) and the Office of Polar Programs at the National Science Foundation (OPP 1643187). Box, J. E. and K. Hansen, 2015. Survey of Greenland glacier area changes, PROMICE newsletter 8, December 2015, http://promice.org/Newsletter_08.pdf. Box, J. E., X. Fettweis, J. C. Stroeve, M. Tedesco, D. K. Hall, and K. Steffen, 2012. Greenland ice sheet albedo feedback: thermodynamics and atmospheric drivers. The Cryosphere, 6, 821-839, doi:10.5194/tc-6-821-2012. Cappelen (ed), 2016. Greenland - DMI Historical Climate Data Collection 1784-2015. Danish Meteorol. Inst. Rep., 16-04. Hanna, E., J. M. Jones, J. Cappelen, S. H. Mernild, L. Wood, K. Steffen, and P. Huybrechts, 2013. The influence of North Atlantic atmospheric and oceanic forcing effects on 1900-2010 Greenland summer climate and ice melt/runoff. Int. J. Climatol, 33, 862-880, doi: 10.1002/joc.3475. Jensen, T., J. E. Box, and C. Hvidberg, 2016. A sensitivity study of yearly Greenland ice sheet marine terminating outlet glacier changes: 1999-2013, Journal of Glaciology, 62(231), 72-81. Mattingly, K., C. Ramseyer, J. Rosen, T. Mote, and R. Muthyala, 2016. Increasing water vapor transport to the Greenland Ice Sheet revealed using self-organizing maps, Geophys. Res. Lett., doi: 10.1002/2016GL070424. McLeod, J. T., and T. L. Mote, 2015. Linking interannual variability in extreme Greenland blocking episodes to the recent increase in summer melting across the Greenland ice sheet. Int. J. Climatol., 36, 1484-1499, doi: 10.1002/joc.4440. Mote, T., 2007. 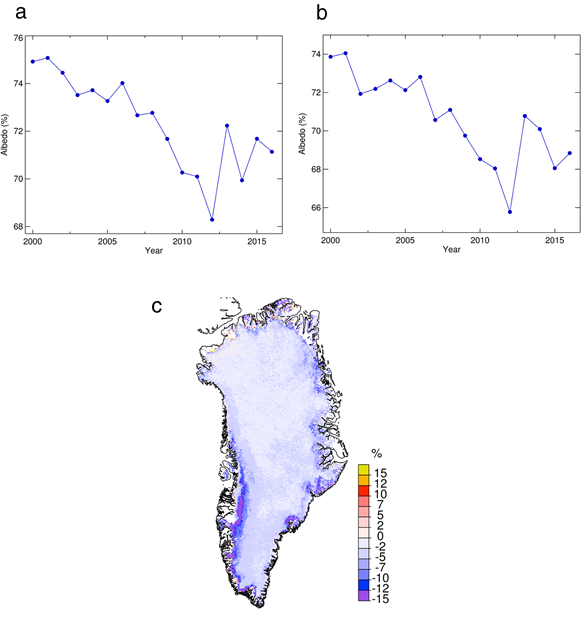 Greenland surface melt trends 1973-2007: Evidence of a large increase in 2007. Geophys. Res. Lett., 34, L22507. Nghiem, S. V., D. K. Hall, T. L. Mote, M. Tedesco, M. R. Albert, K. Keegan, C. A. Shuman, N. E. DiGirolamo, and G. Neumann, 2012. The extreme melt across the Greenland ice sheet in 2012, Geophys. Res. Lett., 39, L20502, doi:10.1029/2012GL053611. Oerlemans, J., 2012. Twenty-one years of mass balance observations along the K-transect, West-Greenland. Earth Syst. Sci. Data, 4, 31-35, doi:10.5194/essd-4-31-2012. Tedesco, M., X. Fettweis, T. Mote, J. Wahr, P. Alexander, J. Box, and B. Wouters, 2013. Evidence and analysis of 2012 Greenland records from spaceborne observations, a regional climate model and reanalysis data. The Cryosphere, 7, 615-630. Tedesco, M. et al., 2016. Greenland Ice Sheet [in "State of the Climate in 2015"]. Bull. Amer. Meteor. Soc., 97 (8), S140-S142. Van As, D., Fausto, R. S., Cappelen, J., Van de Wal, R. S. W., Braithwaite, R. J., Machguth, H., and PROMICE project team, 2016. Placing Greenland ice sheet ablation measurements in a multi-decadal context. Geol. Surv. Denmark Greenland Bull., 35, 71-74. Van de Wal, R. S. W., W. Greuell, M. R. van den Broeke, C. H. Reijmer, and J. Oerlemans, 2005. Surface mass-balance observations and automatic weather station data along a transect near Kangerlussuaq, West Greenland. Ann. Glaciol., 42, 311-316. Van de Wal, R. S. W., W. Boot, C. J. P. P. Smeets, H. Snellen, M. R. van den Broeke, and Velicogna, I. and J. Wahr, 2006. 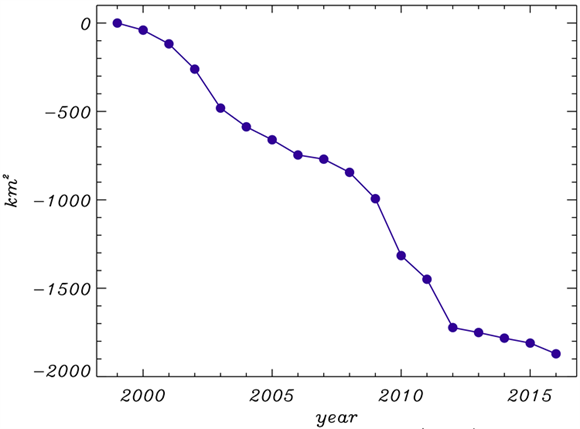 Significant acceleration of Greenland ice mass loss in spring, 2004. Nature, 022 Sep 2006; doi:10.1038/nature05168.